I’m trying to cook with as many organic and non-GMO ingredients as I can find because I’m highly opposed to GMOs, and am trying to take control of my overall health and wellness. 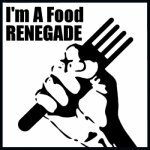 That’s why blogs like The Food Renegade are a great resource to me. Make sure you guys go over there and check them out after you check out my spectacular chicken recipe. I bet you’ll find all sorts of great things over there! For today’s Fast and Furious Friday, I thought I’d share with you a recipe that is a little lighter than some of the recipes I’ve already posted. Contrary to what you might think I don’t always cook with bacon, nor is every other meal pasta related. In fact, many recipes I test, (when I’m not thinking up my own recipes) normally use too much butter or oil or cream and I take it as a personal challenge to make the recipe with less of those ingredients without affecting quality or taste. When it comes to testing recipes I oftentimes find there is room to play around with ingredients which allows me to cut back on a few fat grams and calories even though I’m not a calorie counter and even though I love healthy fats. 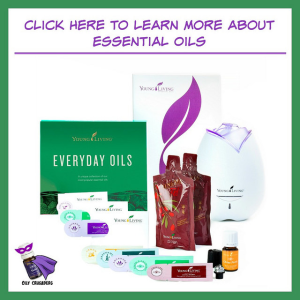 Consumption of healthy fats provide your body with energy. Fat also helps move the vitamins A, D, E and K through your bloodstream and absorb them into your body. However too much of a good thing can be a bad thing which is why I’ll reduce amounts of certain ingredients, especially if the full amount listed in a recipe isn’t necessary, because that way I can have a bigger slice of cake for dessert. Right?!? You know I’m right. 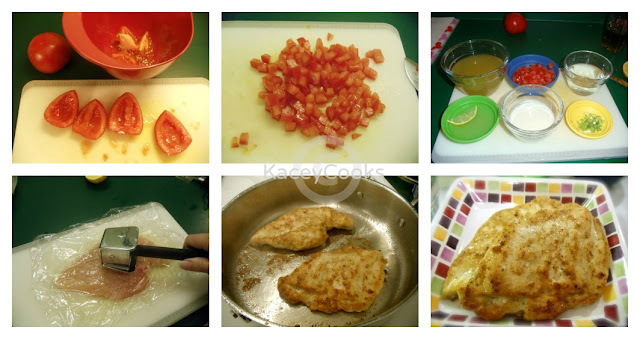 This is easily one of my favorite chicken dishes. It isn’t pretentious, yet it’s pretty enough to stand up to a more complicated froo-froo dish at any high brow restaurant. Also, it’s easy to make. This chicken has FLAYVAH my friends. True, blue FLAYVAH. My mouth is watering just thinking about it. 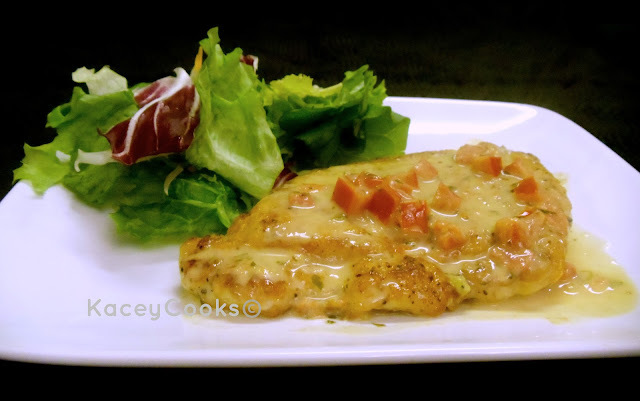 The lemon, cream, and tomato shine through and work harmoniously with the chicken to create a symphony of happiness in your mouth. When I made this the other day, I didn’t even use a fork- as soon as I snapped a few pictures for the blog, I grabbed that cutlet and chowed down with reckless abandon like I was raised by wolves. Yeah, it’s that tasty, and I’m not ashamed that I didn’t use silverware. Sometimes a girls just gotta eat chicken with her fingers. My only request when you make this recipe, would be that you try to cut your tomatoes in as fine a dice as possible- I use plum tomatoes and quarter them lengthwise. I then slice out the middle pulp AND the slimy seedy stuff. Leaving about a quarter inch of tomato “meat”, and making it easy to slice the quarters into julienne strips, and then cut those into a fine dice. I swear it only takes 3 extra minutes to do it this way and the end result is SO pretty. 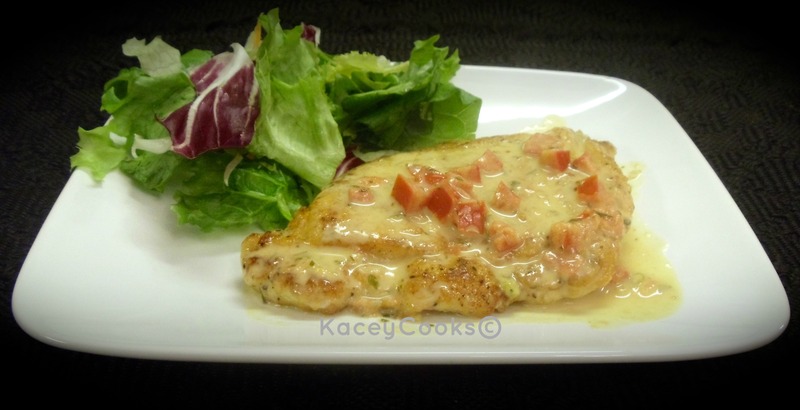 This recipe was made with certified organic poultry, produce, flour and dairy. This recipe is free of GMOs. Take pounded cutlets and season generously with salt and pepper then dredge in flour being certain to coat the entire piece of chicken. Shake off ALL excess. Add 2 TB of olive oil to a large preheated skillet. Saute chicken over medium high heat for about 3 minutes on both sides. Transfer chicken to a platter and pour off fat from pan- wipe out with a clean paper towel if necessary. Deglaze the pan with the white wine (take pan off heat as you add the alcohol) and return pan to heat and cook until nearly evaporated. Stir in diced tomatoes and the half and half. Heat through, add the butter and stir. Add the parsley and green onions cook for another minute. Pour sauce over the chicken and serve. We like to eat this with mixed green salad and some rice pilaf. Lynsey- I don’t think you’ll be disappointed! 🙂 This really is one of my favorites. Thank you for the nice compliments! Wow, thank you so much, Tammy! That is very high praise. Jumping on the non-GMO bandwagon has not gone without sacrifice, but it’s paying off. I think you did a fantastic job on this one Kacey! I think it’s awesome to find another warrior on the non-gmo bandwagon. You go girl! Shawn, I’d love to hear how they turn out and what you think! Enjoy the recipe. It’s one of my favorites!! Looks delicious! I’m so glad that you posted this…I just purchased organic boneless, skinless chicken breasts so I’m definitely making it this week.